Note that there are 30 desks in that classroom! 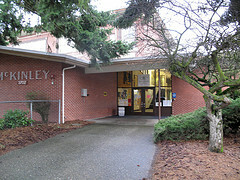 For more historic photos, check out this page from Tacoma Public Library. 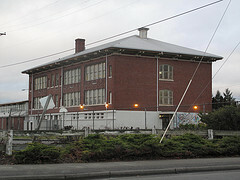 This entry was posted in Historic Sites, Schools, Tacoma, Their future is in question, WA State - Pierce County and tagged closure, Foss, Franklin, Frederick Heath, Geiger, historic, Lyon, McKinley, register, Roadrunner, Roosevelt, Stanley, Wainwright, William McKinley on January 22, 2011 by admin. Please don’t close this school and demolish it or something I went there as a kid till 3rd grade but that school is soooooo important to me I’m in tears right now I have a very very very strong connection to mckinney and I would fail school fail life fail everything because my home (I consister it a home) is the only place I feel safe (besides my real home) I will go down with that SCHOOL IF I HAVE TO! That school means soooooooooooooooooooooooo much to me please keep mckinney open or I will fall and fail I will go down with mckinley no matter what happens to it sincerely Kairi Brincefield.